AMERICAN has incorporated significant and innovative design changes to help prolong service life for swing check valves in water and sewage service. 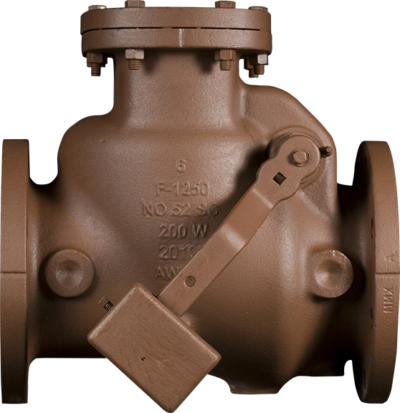 Traditionally, swing check valves have been manufactured with bronze clapper arm shafts. Under severe service conditions where grit or sand has been present, these bronze shafts have a tendency to wear. 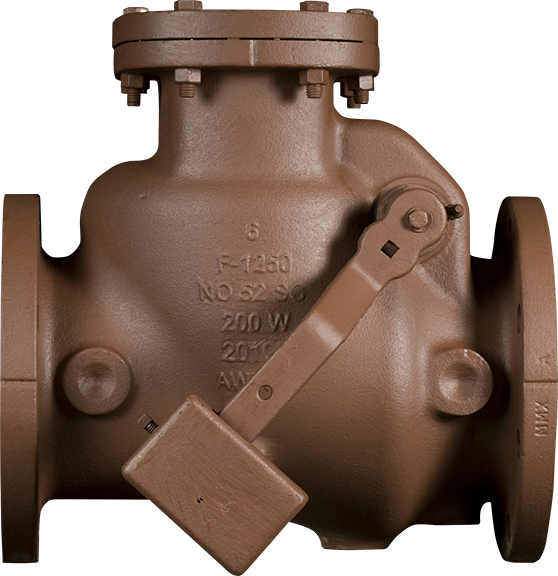 AMERICAN Series 50-SC swing check valves incorporate the following design features to help increase service life. Valve bodies and bonnets are made of gray iron. Generous clearances are provided between the disc circumference and body, as well as the clapper hub and body, which prevent the possibility of binding. Internal contours are specifically designed to provide a smooth flow passage and reduce head loss through the valve. The entire clapper arm and disc assembly are easily removed through the bonnet opening while the valve is installed in the line. The clapper arms are made of ductile iron. The clapper arm shaft hole and disc stud hole are bushed with bronze for wear and corrosion resistance. Clapper arm shafts are made of high tensile strength, corrosion-resistant stainless steel. Clapper arm shafts are retained and located in retaining plugs made of bronze. These plugs act as corrosion and wear-resistant bearings for the clapper arm shaft. The plug design incorporates straight threading, gasketing, and a hexagon wrench-hold to allow easy removal in the field for disassembly of internal parts from the valve. Discs on check valves 4" and larger are made of gray iron with bronze disc rings securely fastened into grooves machined in the disc. The connection between the disc and clapper arm is designed with sufficient clearance to allow the disc to adjust to the seat. Series 52-SC valves are available with the interior and exterior of the valve coated with fusion-bonded epoxy in accordance with ANSI/AWWA C550.